This quilt and I are dating but not quite married. As in, I like it…I just don’t love it yet. I added the aqua sashing instead of the white and I think it throws me off…even though I do love the color! I wish I’d had the forethought to use aqua in the background of the blocks, but it also adds something different so I’m rolling with it. It ended up being a large twin size…and I meant to make a lap size, but I made too many blocks and couldn’t let them go to waste! It will be darling on a bed. 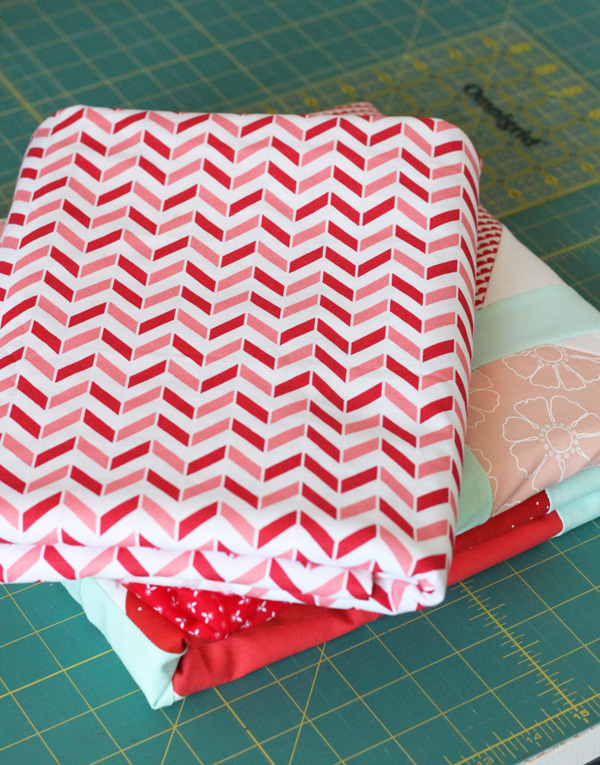 I used this tutorial, and I made the 8 1/2″ (8″ finished) size blocks. Not sure if I’ll tackle quilting it myself yet but I couldn’t resist a picture of these pretty threads with it. I have the best backing all ready for it! This one might not be finished in time for Valentines Day but it sure was fun to make and I can’t ever have enough aqua, red, and pink! Love the hearts, love the aqua, love the back. For me I think it’s the way the sashing is that doesn’t take it to the “love it” category. I have followed your blog for many years and love it!! 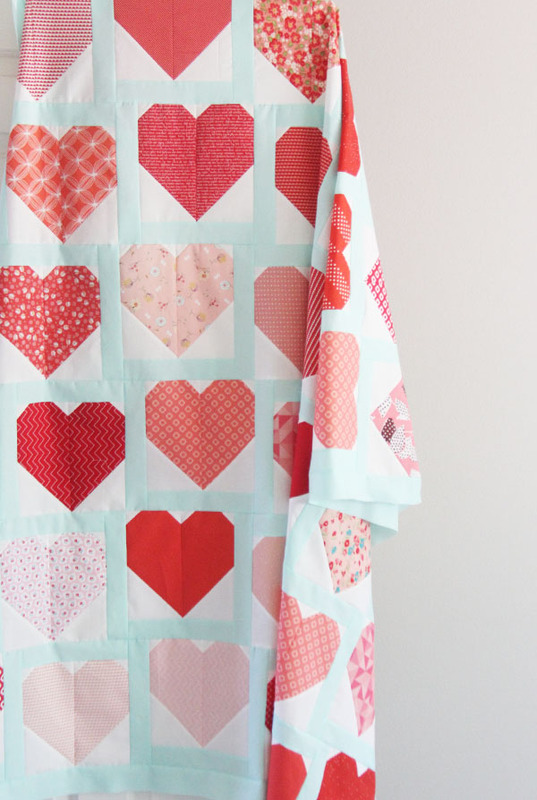 Very pretty quilt, I love hearts and the colors your used. I have made the the little runner you showed I believe last January with the four hearts for our night stands. They were fun. 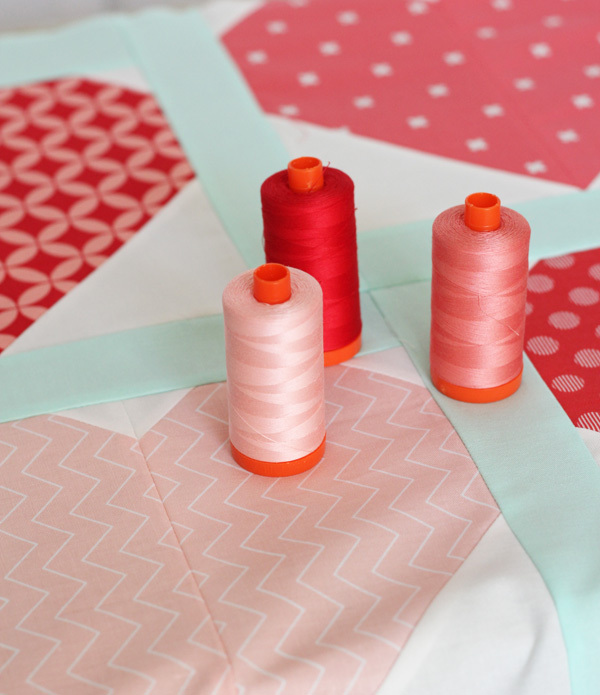 Enjoy your blog and your quilts are beautiful. I think it’s beautiful! 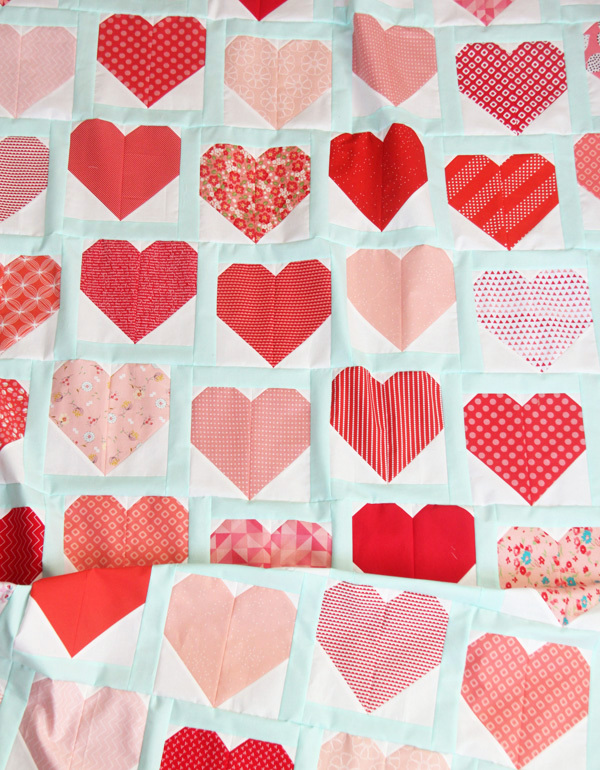 I want to make a heart quilt someday, I was thinking of pink, lavender, and yellow, pastels like the heart candies :) I like the fun sashing, it’s different! It will be a beautiful quilt! Way to try something new and different! LOVE the backing! The pale aqua sashing is an inspired choice! It gives the quilt visual movement and zing. I love it and can’t wait to see it finished. Ooh, that IS the perfect backing! I love it!! I like the aqua. I’m not a fan of sashing in general….but I think that looks good! I absolutely love the backing…can I ask if you bought it recently? I’d love to get some!! I bought it a few weeks ago at Joanns, but I don’t think it’s a Valentines Day print! This is beautiful! Love it the way it is – and the backing – super gorgeous! I predict you will love it once it is quilted! It’s a sweet, sweet quilt. Can’t go wrong with that color combination…..then that backing happened – perfect! I think what you aren’t hearting is the aqua is so close in value. Next time one or two steps of greater saturation on the blue. And possibly a few random white hearts on red. Beautiful as always! Working on those blocks now. Never considered aqua but looks great. Do you mind telling me if that’s a Kona & if so what color. The aquas I find seem much darker! The aqua is Kona Ice Frappe…it’s a new favorite! LOL I feel you about the like, not love feeling. I’m quilting a quilt right now that has been hanging around for two years. I just want it done at this point!! I understand though. Sometimes you make something and you just don’t love it. That backing! Totally caught my eye. Love it!! Ive had quilt tops that Ive not really cared for. Until I quilt them. Then I love em. BTW, I love this quilt! I have 2 hearts made using your pattern, planning to make a quilt. Using up scraps.